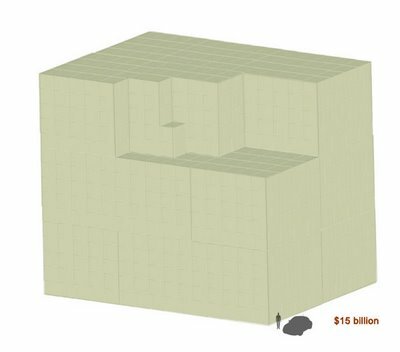 Have you ever wondered what $315 billion dollars looks like? 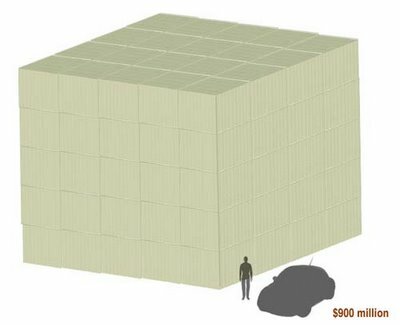 If so, check out this link visualizing $1 stacks in comparison to a person and car! The visual guide might be a bit deceiving though when compared to the famous $207 million drug bust some time ago. Either way, I’ll imagine being Scrooge McDuck in DuckTales swimming through it all! This entry was posted on Friday, January 4th, 2008 at 12:12 am	and is filed under art, design, entertainment, food, fun, information. You can follow any responses to this entry through the RSS 2.0 feed. You can leave a response, or trackback from your own site. Holy smokes, that’s just insane! Thanks for sharing _tango! how long does it take to print that much money? how much does is cost to print that much money? how many tons of cotton or what ever they use does it take to make that much paper? how many gallons of ink? wow, so more than triple for 1 trillion dollars (or about what this bailout out of the financial industry is costing so far). Well, yeah, but what if you used Billion dollar bills???? Ah yes… And how much is the bailout? 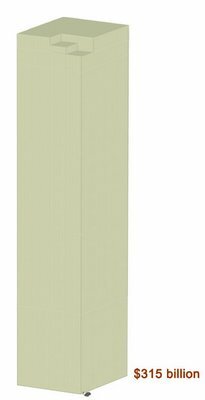 I need to make myself a skyscraper out of $100 bills. they only print a small fraction of the required money supply. the rest just exists as binary data in a computer. I am going to need a bigger wallet! I’ll pay the huge printing costs if I get to keep 10% of the money. I’m such a soft touch. Good questions Mark. My guess is that most of that isn’t really printed at all. Just digits in computers, credit cards, and so on. And much of the paper “money” is just cheques written for any amount. As you know, no paper currency has ever survived very long. The Federal Reserve is a private banking corporation owned and controlled by international banking dynasties. Wake up folks! Look out world we are difinetly in trouble. Obama and the government are going to have a field day when he gets into office and I am going to go to Costa Rica to live. Costa Rica is such a good place to live because it has a protection agreement with US. US makes sure it is sunny in Costa Rica. Now, that is where you want to go? O.K., say US crashes. Do you know who is going to rule Costa Rica then? 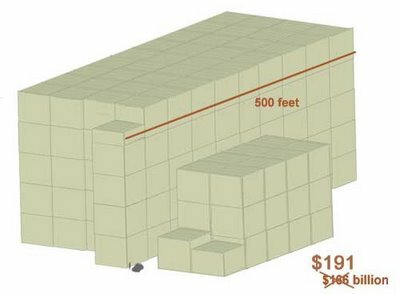 that comes to 59,185,152 cubic feet. 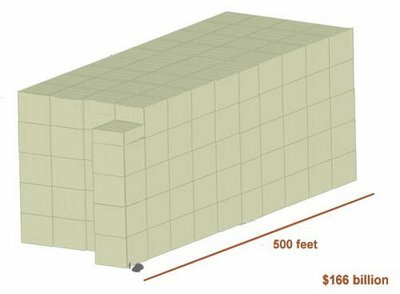 59,185,152 cubic feet (north tower) Divided by 31,250 cubic feet (size of 900 million one dollar bills) = 1893.92 cubes of 900 million one dollar bills. 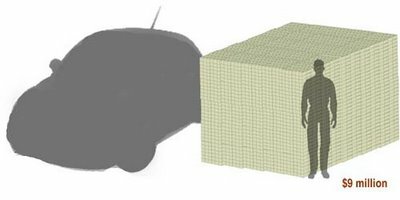 1893.92 cubes x $900 million = $1,704,528,000,000 which is $1.7 Trillion. 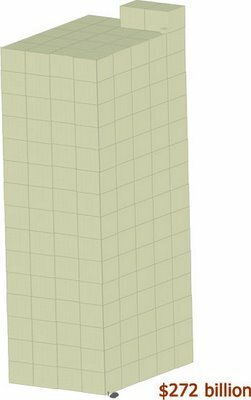 Both the south and north tower would come to $3.4 Trillion. 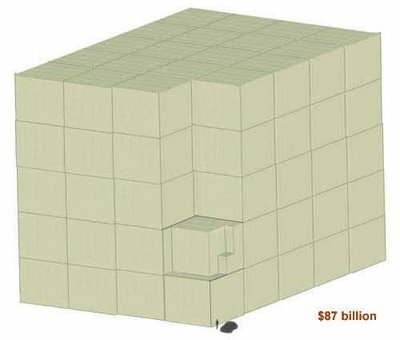 The total combined bailout package between the taxpayers, Treasury Dept. and Federal Reserve is now…$5 Trillion? Yupp…they said the World Trade Center would be rebuilt. Only we are paying for it 10 times over. Your caluclation is totally off on the second figure. $3,000 is 6 stacks of $500 dollars. I am sorry to say that 5 ($100) bills does not measure 2″ high ! It’s not even close! 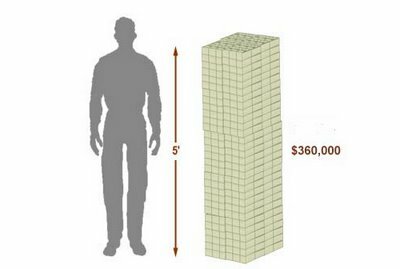 In fact $6000 does not even measure 1″ high. So this messes up every other calculation exponentially. the graffics are really cool, and you had me going for a little bit. So what are we now – 11 trillion in debt? 50 or so trillion in unfunded liabilities? (bills coming due) How big is the one dollar billding which those numbers create? Funny how our government and the tax payers can be so far in debt that there is no chance that it could ever be paid off and yet the bankers and the Federal Reserve always seem to come out with smiles on their faces. Could it be that it’s planned that way? Visit the Freedom Force International website to learn more about our collectivist government, the monster called the Federal Reserve. The worst is yet to come, so it wouldn’t be a bad idea to be informed about it all – how it came about, why we’re here, and what can be done about it. Is less dollars supposed to be better than more dollars? We also have 7 Billion people on the planet! That’s a big number too…so should we have less people and less dollars? This page is absolutely pointless. Get Real, since you don’t mind a lot of money being taken from you, would you mind giving all of your money to the rest of the posters on this site that understand the concepts of theft and incompetence. Then he flashed that famous Carson grin. Hey. If we gave the Grand Illuminated Washington / Wall Street pooh-bahs one trillion dollars and told them to spend $10,000 a day and not come back until they‘ve spent it all, they’d be gone for 277,778 years!!! It does not matter if it printed or just electronically created, it will still massively devalue the currency. Buy silver or gold through this globalist banking plan to lower our standard of living to merge the north american economies.